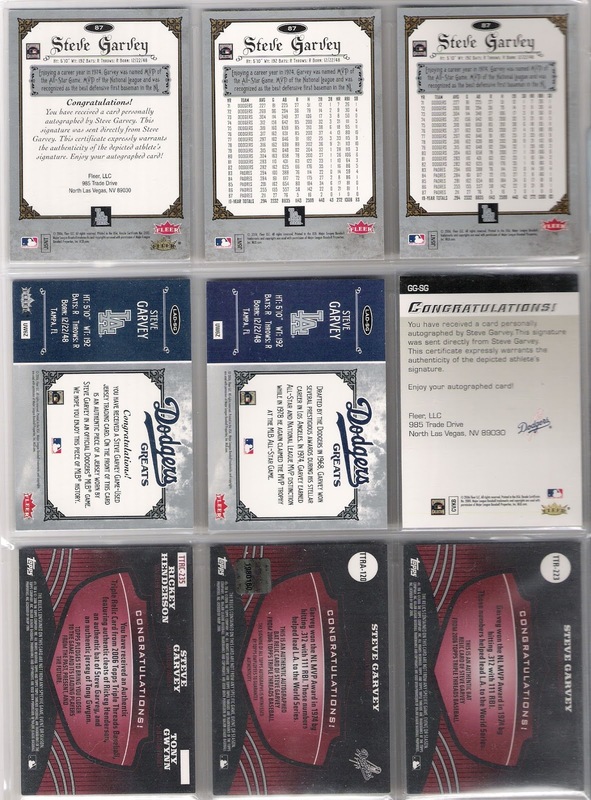 so, upper deck bought the rights to fleer and issued the greats of the game set in 2006. there are 26 different cards available for steve garvey from that issue (many of which are 1/1 printing plates), and i am missing most. some of those are also rare bat barrel cards, but others are a /299 copper parallel and /50 dodgers greats auto cards. 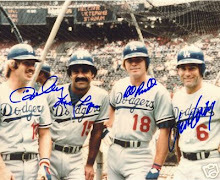 speaking of the dodgers greats cards, i appreciate the dodger stadium at sunset inset photo. on to triple threads. 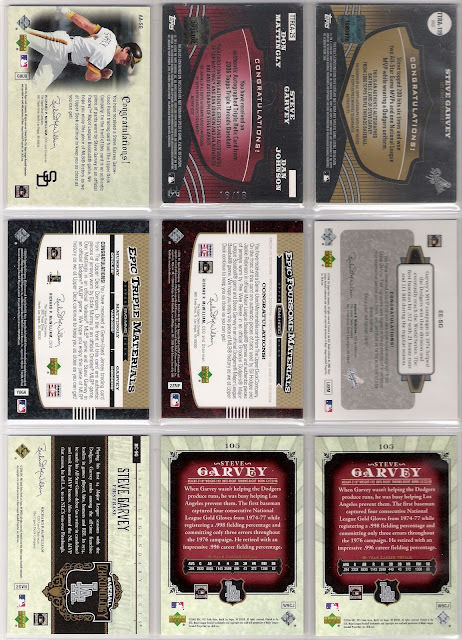 garvey has two triple relic cards. the one i have the "base" version of spells out "mvp". the other spells out "lad". likewise, the relic/autograph cards have two versions (mvp and lad), and we'll see a version of the other on the next sheet. as for the combos card with rickey and gwynn, beckett tells me that the rickey relic is from his cleats. that beats the garvey bat and gwynn jersey pieces for sure. 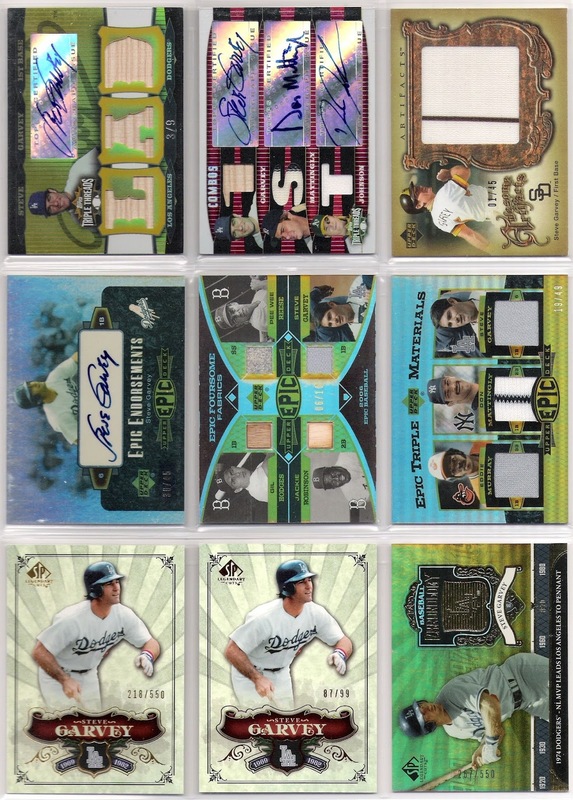 so here i have the gold version of the "lad" triple threads auto/relic, as well as the "base" version of the don mattingly/dan johnson auto/relic. there was a bit of prospecting going on with these triple threads combo cards at the time, which was not the case with upper deck's epic release as they used steady eddie murray to take johnson's place on the sixth card of the sheet. 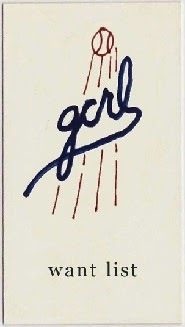 just next to that one is a pretty cool card. i don't fully understand the use of garvey as a fourth to gil hodges, pee wee, and jackie, but i am not complaining. and, for all the ebay 1/1 geeks, my version is 06/10 which is garvey's jersey number. one card from that set that i would love to have is a true 1/1 bat barrel card featuring garvey, manny mota (! 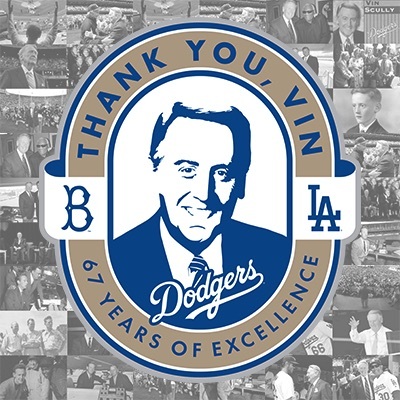 ), steve yeager, steve sax. that would truly be epic for this dodger fan. elsewhere on the sheet, i am a bit embarrassed that i only have one card from 2006 upper deck artifacts as there are a number of other garvey relic and auto cards out there from that set. the back of that artifacts jumbo relic that i do have, however, let's us know that the card features game worn pants, which is the bottom of the relic hierarchy. still more to come - stay tuned!